“Z” is for zoo and for zoológico! 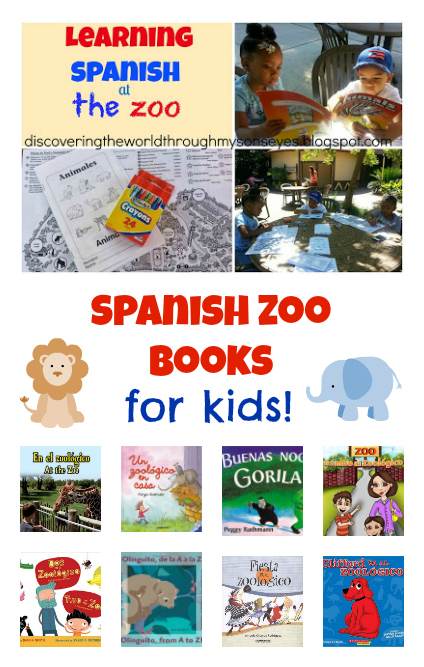 This post is about learning Spanish at the zoo, and Spanish zoo books for kids. Note: I’m re-publishing this old post for All Done Monkey’s 2016 edition of 31 Days of ABC’s Series. I’ve revamped the content, added a list of Spanish zoo books, and included details of the series. 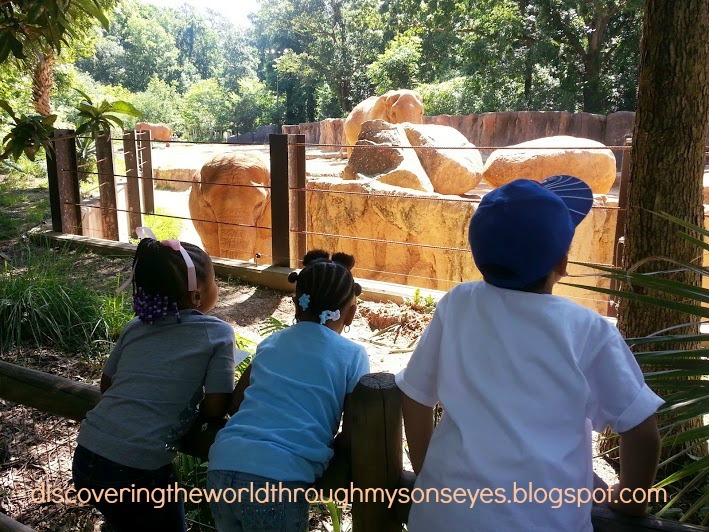 Learning your animals in Spanish is fun especially when you learn them at the zoo! Little one, his best bud, and I met with a new found friend and; her mom from little one’s Spanish immersion language class at the zoo. What is funny about this play date is that one of my son’s friends knows Spanish, and the other one doesn’t. So it was interesting to see how my son was teaching his best bud how to say the animals in Spanish. What was even funnier was that shortly after practicing she comes out “talking” in Spanish! Truth be told, I had no idea what she was saying because it didn’t even sound like Spanish or English! I was laughing so hard that I couldn’t help myself, and my son tells her, “That’s not Spanish!” So on they went to practice some more the animals in Spanish. Once at the zoo we all greeted each other. Little one’s best bud greeted little one’s new friend with, “¡Hola!” This was out of the blue, and unexpected. When I asked her where she learned that word from she says, “¡Dora!” Sweet! We let the kids play a little so they can warm up to each other before beginning our Spanish lesson. For the Spanish lesson I used a mini-book from Scholastic’s Vocabulary-Building Bilingual Mini-Books. I really enjoy this book because it uses cognate words. Cognates are words descended from a common ancestor; that is, words having: the same linguistic family or derivation (English). This is really helpful for English speakers learning Spanish. (You can see a list of the animals below). For the play date, I made copies of the “animales/animals” bilingual mini-book, and brought with me a box of crayons. At the zoo each child picked up their own map of the zoo. To begin our Spanish lesson each child wrote their names on the mini-books, and I read to them the names in both English and Spanish. They repeated after me. They also circled on the map where the animals were located, and we reviewed what route we were going to take. 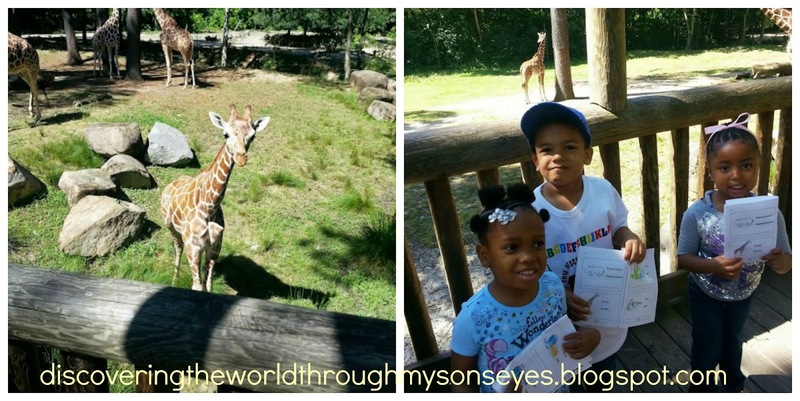 Afterwards, we walked through the zoo looking for the animals but we also made some frequent stops to look at other animals that weren’t in the mini-book. Once they found the animal we would stop so they can color it in their min-books (this also gave us an opportunity to review the names again in Spanish, and to take a break!) They were pretty excited, and enjoyed their outing at the zoo. The little ones pointing at the jirafa in their mini-book. Looking for the animals that were in the mini-book was exciting and fun! Would love to hear how you make learning fun for your children! Please comment, like, share or pin! After taking a break last year due to the arrival of Baby #3, we are back with one of my favorite series, the 31 Days of ABC! You can look forward to 31 more days of activities, crafts, books, apps, and more, all dedicated to teaching young children the alphabet. I am so happy to be working with an amazing group of kid bloggers, who will be sharing their amazing ideas with us in the coming days. And this year for the first year we are also adding a giveaway, so be sure to scroll to the end and enter for a chance to win! So join us as we jump, skip, hop, and read our way through the alphabet this October! Don’t forget to follow our 31 Days of ABCs Pinterest board for even more great ABC ideas! So fun! I love the story of your son's friend speaking Spanish. My oldest loves to tell me she is speaking Spanish and if I tell her, "no that's not Spanish" she responds. "It's language Mama – you don't know it." Another great activity in a fun location! Hahahahaha your daughter is a smart kid! Too funny! Get started on practicing Spanish, and before you know it she'll be really talking in Spanish! What a great playdate! And that is really cute that his best friend is trying to learn Spanish, too. A friend of mine taught kindergarten, and there were a couple kids that only spoke Spanish when the year started. Another little boy was sure that if he just talked to them in English REALLY LOUD they would understand him – if only it were that simple lol!